Establish European-Style Apprenticeship Training Centers That Help Our Youth, Adults & Veterans Obtain Hands-On Technical Skilled & Trade Experience, Helps Local Manufacturers Secure Qualified Long-Term Employees and Drives Competitive Economic Growth By Providing A Well-Trained Community Workforce. 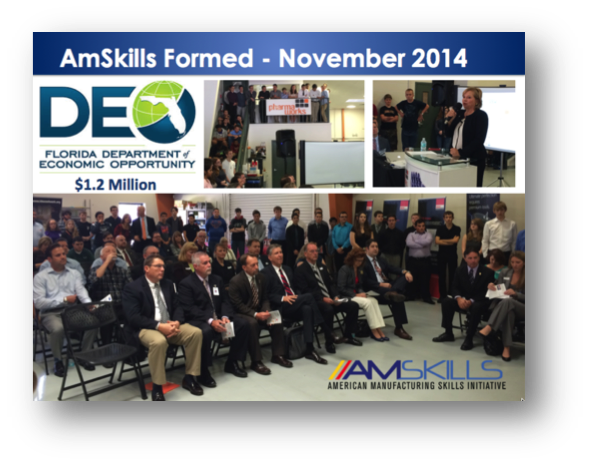 In November 2014, three Tampa Bay Counties (Pasco, Hernando & Pinellas) joined together and created an Interlocal agreement to officially form the ICTC Governing Board dba the American Manufacturing Skills Initiative, otherwise known as AmSkills. AmSkills was established to create a European-Style Apprenticeship Training System that models the highly successful European model for workforce training. While this is the goal, the government, education and business environment is very different in the United States than Europe, therefore it could take years to accomplish, if at all. AmSkills however is working to incorporate the best practices learned from Europe and incorporating into our system to design an Apprenticeship program that meets the needs of our local community. In 2016 the Florida Chamber of Commerce completed a survey of local colleges which indicated that only 11% of employers thought that college graduates are prepared for the workforce; and locally more than 74% of those interviewed for jobs in manufacturing were un-qualified for the job. In addition, on average more than 22% do not graduate from high school in Pasco, Pinellas and Hernando Counties, which equates to approximately 66,000 young adults who don’t earn a high school degree. AmSkills is dedicated to providing 80% hands-on skills training to youth, adults and veterans for high demand manufacturing careers, providing technical, soft and life skills training, and partnering with industry to provide potential long-term employees. Tampa Bay has the largest concentration of manufacturers in the State of Florida and AmSkills is not only helping our existing base to thrive, but also to recruit new manufacturers to our community.